Indiator comes out with amazing 4 days Delhi-Agra-Jaipur Golden Triangle tour package to the heritage cities of India – Delhi, Agra and Jaipur. All the three cities having so many historical significances, cultural diversities, gargantuan forts and palaces, magnificent sights, panoramic view and much more. Appreciate the beauty and architecture of Taj Mahal. Know more about the Mughal Dynasty by an expert guide. Explore the robustly built Red Fort of Agra and Delhi. Experience the charm of art and architecture of the Mughal era. Enjoy the Panoramic view of Jal Mahal. In the morning between 9:00 -11 am (Pick up from Delhi Hotel and Airport), our representative along with driver takes you for the Delhi Agra Jaipur Tour Package. Initially, we will visit you to the Red Fort, situated in the old Delhi area. The Fort is divided into various buildings which now converted into a museum for visitors showcases the valuables of Mughal dynasty. Red Fort closed on every Monday if you are doing this tour Monday then we take you to Humanyun Tomb instead of Red fort. Then, we move to the India Gate, a 42-meter high archway constructed in the reminiscence of soldiers, their names are carved into the walls of India Gate. Subsequently, we will drive you through the Parliament House and the President House (Rashtrapati Bhawan). After Lotus Temple, our guide will take you at the famous Indian Restaurant for lunch(own expense). After lunch, we proceed to the Qutub Minar, the world’s tallest minaret of the 11th century made up of brick. After that, our driver will drop you back to the Hotel. Next morning check out from the hotel, our driver will pick you up around 7:00 am from your Delhi hotel and drive you to the Agra for around 4-5 hours journey for the further journey of your Delhi Agra and Jaipur Golden Triangle Tour. 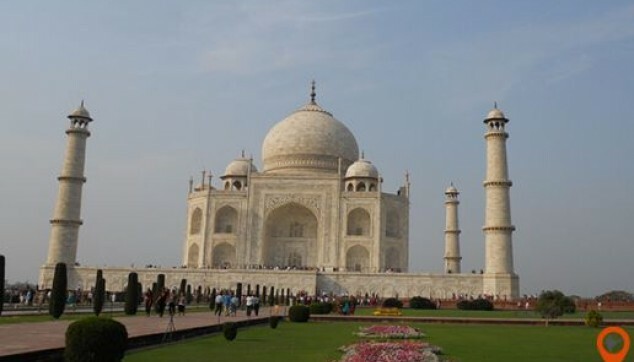 On arrival at Agra Check into the Hotel, after freshening up, our expert guide will join you for your Agra excursion and proceeds you to the globally famous Taj Mahal. Taj Mahal was constructed by one of the Mughal emperor Shah Jahan in the reminiscence of his beloved wife Mumtaj Mahal. Taj Mahal is globally acclaimed by the visitors due to its fascinating architecture, amazing carvings, and picturesque view. After Taj Mahal, we will take you to one of the finest restaurants of Agra for a delicious lunch. (Own expense) After Lunch, our next move is towards the Agra Fort also remarked as the treasure house of Mughals. The fort houses so many buildings include Diwan-i-Am, Nagina Masjid, Diwan-i-Khas and much more. After that, the guide will take you to visit the Marble factory & some famous shops. Later, you will be a drop back to the hotel and enjoy overnight stay at Hotel. In the next Morning after breakfast and check out from the Hotel, our chauffeur will take you to visit the Fatehpur Sikri, renowned for the tomb of Saint Sheikh Salim Chisti. This place is constructed by Akbar for the residence of Mughals but due to some water issues, it was not worked out accordingly. After completing your visit, you will be proceeding to the Jaipur journey, en route you will enjoy a palatable lunch at Rajasthani Restaurant at your own expense. On arrival to Jaipur check in to the Hotel, after rest and fresh up, our driver will take you to the visit to Birla Temple and drop you back to the hotel for overnight stay. 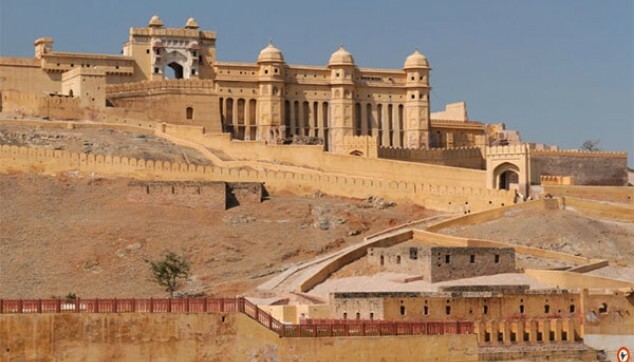 In the morning after breakfast and check out from the hotel, our driver along with the expert guide will take you to the Amber Fort, a perfect example of Rajput and Muslim style of architecture. You can also enjoy an elephant ride here in Amber Fort. After that, you will be driven towards the Jal Mahal, placed in a midst of a Man Sagar lake. The panoramic view of the Palace makes it the most romantic place of Jaipur. Here, you can have fun on Camel. 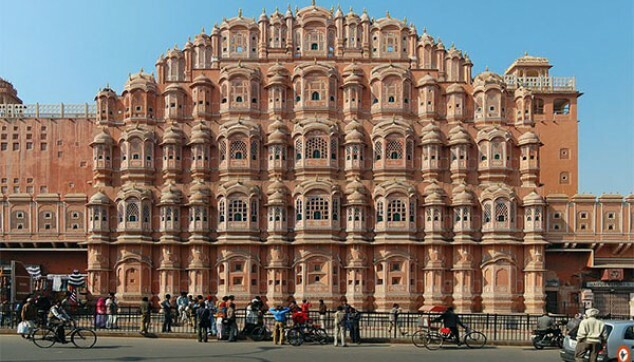 Afterward, our next move is towards the Hawa Mahal, the most iconic place of Jaipur. This five-storey palace has around 953 windows. After that, we will move you towards our last destination of the 4-day Golden Triangle tour i.e. City Palace, this magnificent palace preserved a rich assemblage of weapons, dresses, artifacts and jewellery of that era. Finally, your Golden Triangle Trip to Agra and Jaipur from Delhi come to an end with dropping you back to the Delhi hotel or airport around 7 PM. � If you are taking this tour on Monday then Red fort Visit will be not part of this tour because For closed on this days. Lotus Temple also closed on Monday but we shall arrange the outside visit of Lotus temple in case your doing this tour on Monday. � Monuments order can be before or after it’s depend on your Hotel location. Sightseeing with English speaking tour guide in Delhi Agra and Jaipur. Entry Fee of Delhi Red Fort, Qutub Minar, Lotus Temple. Entry Fee of Agra Taj Mahal, Agra Fort & Fatehpur Sikri . Entry Fee of Jaipur Amber Fort, Hawa Mahal & City Palace. Delhi - Agra – Fatehpur Sikri – Jaipur - Delhi by Private air condition Car. 29-10 day’s prior commencement of tour, 25% of travel cost. 10 days prior commencement of tour, 50% of travel cost. Less than 09 day’s prior commencement of tour, No Refund. I did this trip and what would normally be a miserable, dull, week in January. Instead I had one of the most interesting weeks of my life seeing all the sights in India, weather was like a nice British spring or early summer. Did so much in one week - highly recommended. While some of the accommodations had laundry facilities, we found that the day was too full to find the time to wash clothes. Make sure to pack enough clothes! Great and efficient way to see all the highlights of the area.